One of the newer complaints I have heard a lot is how quickly Codexes are being updated and replaced. While this is certainly a valid complaint, I just can't get behind the idea of people saying they won't buy a new book because the rules will be invalid in X number of years. All of these books are a treasure trove and here's why. 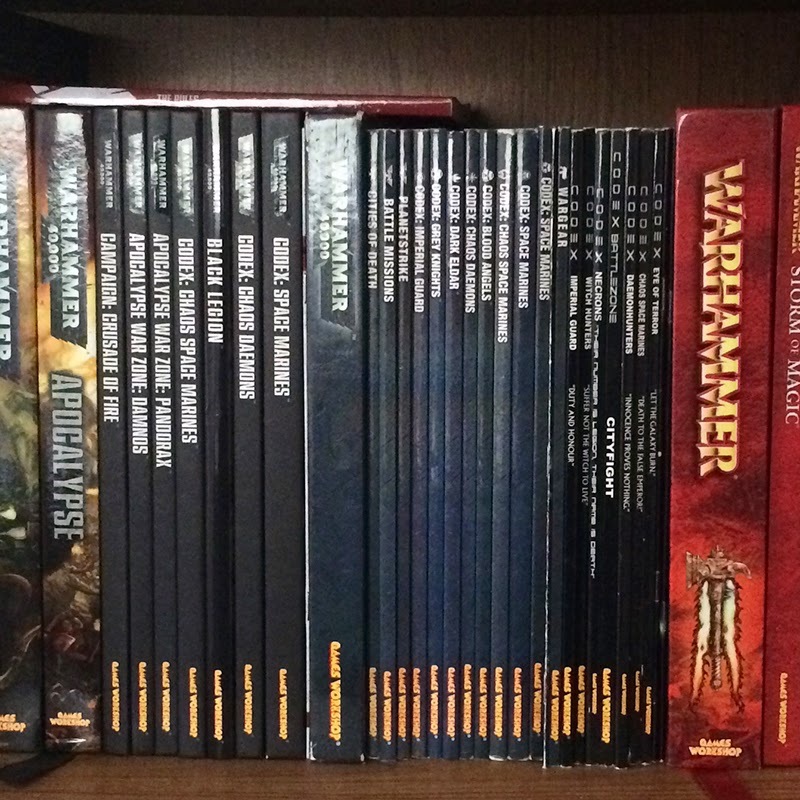 I have been collecting and playing 40k and Fantasy since 3rd and 6th edition respectively. I was mostly a 40k player that whole time, so I have plenty of codexes. For Space Marines alone I have four different versions and for Chaos Space Marines I have four as well plus two supplements. 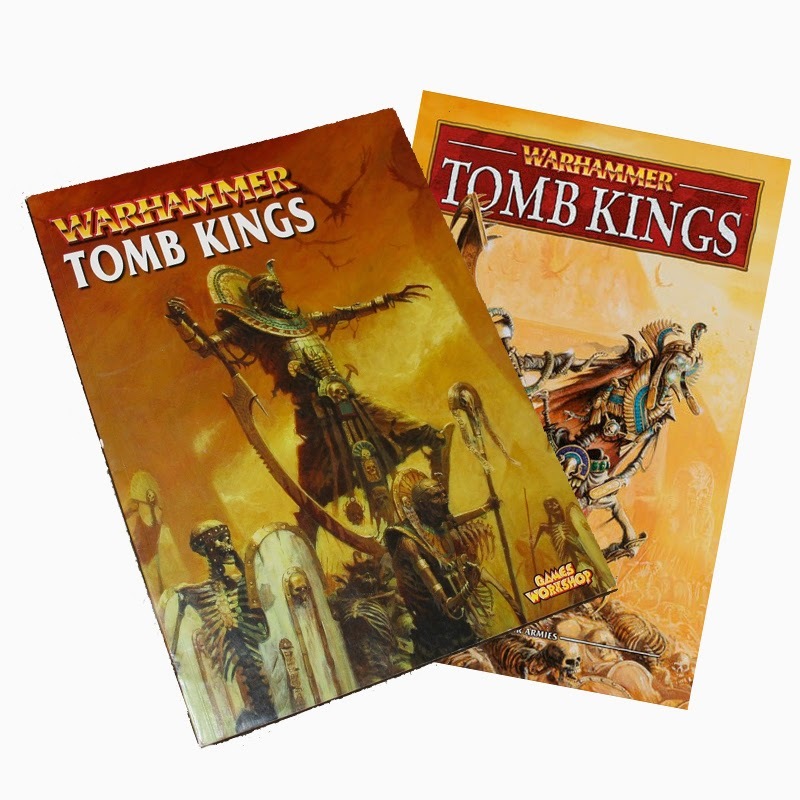 Of course only one version of these books is still valid as far as playing the game is concerned, but if you are buying Army Books and Codexes just for the rules then you are missing out. On average the rules portion of any book is only about 1/3 of the content, a half at most. The rest of it is filled with evocative background lore, art work, and beautifully painted collections of miniatures. This to me is whats most important, and that's because it lasts. 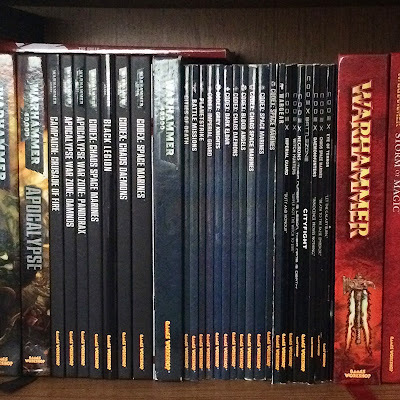 When the new version of the Space Marine codex comes out in a month or so I will still crack open my 6th edition version to pour over all of the artwork and lore. I still go back and read bits and pieces from even older books; the Eye of Terror and Armageddon campaign books being some of my favorites. 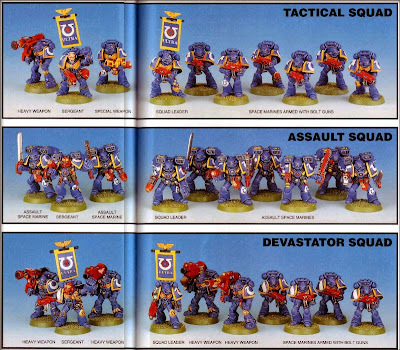 With even older books, such as the 3rd edition Imperial Guard book, I enjoy looking through the older collections of models. Most of those sculpts are no longer available and I find it infinitely fascinating to look at how our hobby has evolved. The paint jobs alone are worth looking at. There was so much red back then, seriously, pretty much every gun casing was red. For me these books have only lost a fraction of their value with their outdated rules. Even here though I find inspiration for my current force. Sometimes I can look at older units that either no longer exist or have changed in some way and think to myself, man, it would be cool to have my unit reflect this older style more. This is especially true for special characters. Now that is a sweet Doomrider. Thank you 3rd edition codex. As we all know special characters have been dropping like flies recently when their books get updated. Anything without a model, or with an extremely dated model, is getting left out of the newer publications. While it may no longer be possible to field these guys in your army with special rules, it's still entirely possible to convert a model to represent this hero on the tabletop. Does anyone remember Captain Cortez, or Chaplain Xavier, or Doomrider? How cool would it be to have a 3rd War for Armageddon Salamanders army led by Xavier? He may be dead in the current timeline, but nothing says you have to build your army around the current date, 30k is a perfect example of this. So before you bemoan the changing rules and newer editions of Codexes and Army Books that are coming out, just think about how you now own a chunk of history. Your outdated book is now a treasure trove of information just waiting to be rediscovered in a year or two. Certain aspects of the lore change or get left out, artwork gets replaced, and models get updated. So now instead of only having access to what's new, which is a very narrow swathe of our hobby, you can look at the old and the new and take what you want. 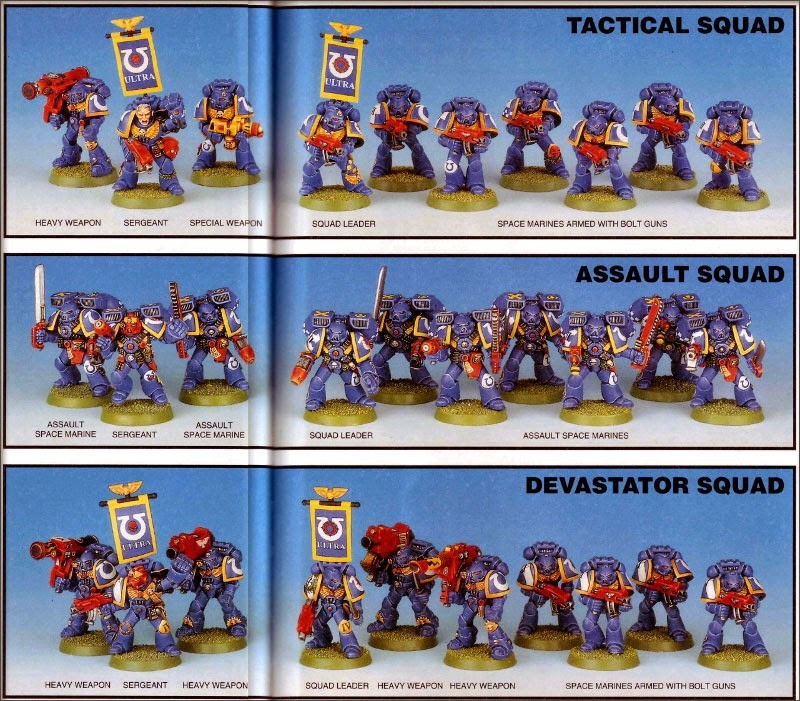 Why not play out an alternate End Times storyline for Fantasy based off the Storm of Chaos campaign book, or play a few games from back when Lysander was just a Veteran Sergeant leading Tactical squads and chart his rise to Captain of the first company. These things are source books, and if you treat them merely as rules pamphlets you really are missing out and depriving yourself of a majority of the value right from the get go. So, what are you favorite older Army Books or Codexes that you still flip through from time to time? My 6th edition Tomb Kings book has been out on my table almost as often as my 8th edition one while I've been building my army.